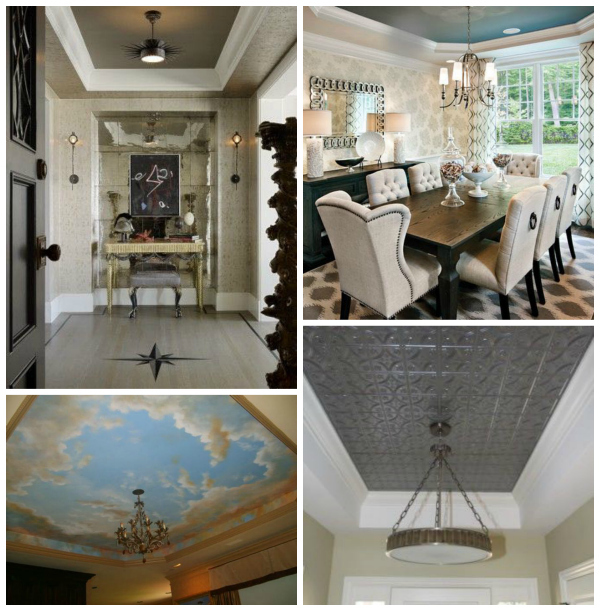 What is the difference between a tray ceiling and coffered ceiling? The tray ceiling is one large recess in a ceiling while the coffered ceiling has a series of sunken panels. TRAY CEILING: a recess in a ceiling that resembles an inverted tray. Often rectangular, though it can be other shapes, the tray ceiling is used to create architectural interest by breaking up a flat ceiling line. COFFERED CEILING: A coffer is a sunken panel in the shape of a rectangle, octagon or square found in a ceiling, including ceilings in domes or vaults. A series of these sunken panels creates a coffered ceiling. Also called a “caisson ceiling” or “crossed beamed” ceiling. Paint in a accent color or a mural often decorate a tray ceiling. This first example is further embellished with molding. Many architectural icons have a coffered ceiling. Here are some examples. Coffered ceilings clockwise: at Mir Castle, Belarus, the dome at Museum of Asian art of Corfu, Greece, at Elahbel tower tomb, Palmyra, Syria, at the Basilica di Santa Maria Maggiore, Rome.